Drive your guests wild with anticipation! 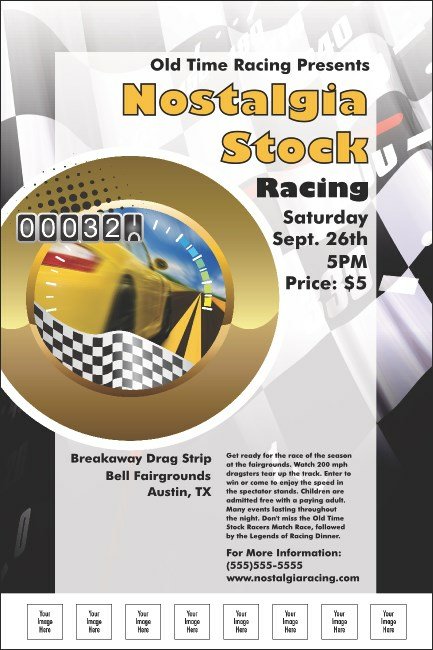 Armed with a stack of Stock Car Racing Posters, you’re more than prepared to let the world know about your next event! Your event information stands out against a background of bold colors and racing images! And, with nine spaces to upload your own photos and logos, you simply can’t go wrong! Get started with a full promotion by checking out the matching event kit at TicketPrinting.com!